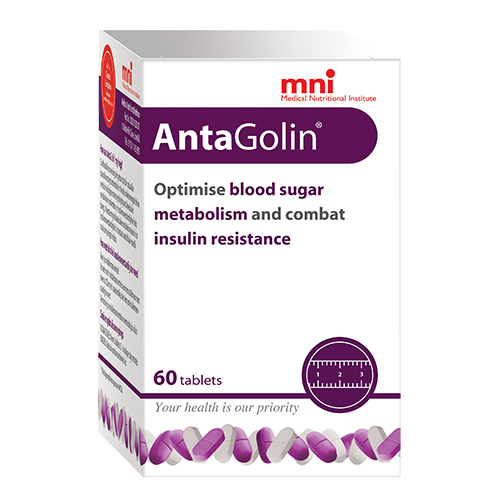 AntaGolin optimises blood sugar metabolism and combats insulin resistance. AntaGolin’s unique blend of natural ingredients work together to combat insulin resistance by supporting multiple pathways involved in blood sugar metabolism. What can AntaGolin assist with? AntaGolin contains a unique blend of plant-derived (phytochemical) compounds that have all been scientifically documented to help regulate blood sugar and insulin levels. These ingredients work together to slow the absorption of glucose from food, as well as support and optimise the body’s response to increased blood sugar. These are Barberry root extract, Banaba leaf extract and inositol. Barberry root extract contains berberine, a botanical alkaloid present in a number of plants which have been used in traditional Chinese medicine for a number of conditions, including obesity and diabetes. Berberine is one of the most heavily researched plant-based compounds available, and has demonstrated the ability to slow carbohydrate digestion and absorption, improve insulin signalling, suppress fat formation and enhance energy metabolism. Banaba leaf extract is prized in some Eastern medicine systems for its ability to alter blood sugar levels. The tree is native to India, China and the Philippines, and is valued for its violet floral displays. Its ability to reduce blood sugar, inflammation and carbohydrate absorption as well as improve insulin signalling has been proven scientifically. Inositol is a plant-based compound similar in structure to glucose. It is present in a wide variety of foods, including beans and nuts, and is naturally synthesised in the body. Scientific research has shown it is able to block glucose absorption from the diet, as well as aid in insulin signalling. Who may benefit from taking AntaGolin? AntaGolin can be used by anyone who is suffering from excess body fat, struggling to gain control of their weight or may be suffering from a degree of insulin resistance. Because of its blood sugar regulation ability, AntaGolin is ideal for pre-diabetic and type 2 diabetic subjects, especially over the long term. AntaGolin can also be used by woman suffering from Polycystic Ovary Syndrome (PCOS). Take 2 tablets two to three times a day with meals. Who should not use AntaGolin? AntaGolin generally has a low side-effect profile even when used for extended periods. Gastrointestinal side effects, including abdominal fullness and nausea have been reported. Individuals on diabetic medication may develop low blood sugar, especially if AntaGolin is taken on an empty stomach. It is therefore recommended that AntaGolin is taken with meals. Can AntaGolin be used in combination with prescription drugs such as anti-diabetic medication? Yes, AntaGolin may be taken with most prescription drugs, including diabetic drugs such as metformin. Caution, however, must be taken with all classes of oral anti-diabetic medication, as the blood sugar-lowering effect of AntaGolin may enhance their action and leave you with symptoms of low blood sugar. If you are on anti-diabetic medication, consult with your doctor about whether AntaGolin is right for you. Caution must also be taken when used with warfarin. Where can AntaGolin be obtained? South Africa: At any pharmacy. No prescription is required. Namibia: At any pharmacy. No prescription is required. International: Email us at info@mnilifestyle.co.za for international purchasing information. The unique blend of bioactive compounds contained within AntaGolin work on multiple levels involving various biochemical pathways responsible for metabolic regulation. These include reduction of carbohydrate digestion and absorption, and optimisation of certain biochemical pathways that regulate body fat accumulation and blood sugar levels. These ingredients are Barberry root extract, Banaba leaf extract and inositol. AntaGolin® contains Insul-X2™, a proprietary formulation prepared from Barberry root. Its main constituent is the botanical alkaloid berberine [C20H18NO4+], a substance naturally found in a highly concentrated form in the roots, rhizomes and stem bark of various plants such as Chinese Goldthread (Coptis chinensis), Barberry (Berberis vulgaris) and Goldenseal (Hydrastis canadensis). Berberine, as a component of these plants, has been used for many centuries in Chinese traditional medicine where its therapeutic applications include obesity and diabetes. Several randomised, placebo-controlled studies have investigated the therapeutic effects of berberine on insulin resistance, either in monotherapy as a single agent, or in combination with other botanical compounds. These include studies on female subjects with Polycystic Ovary Syndrome (PCOS). Various clinical, metabolic and biochemical parameters were assessed in the subjects before and after treatment. A statistically significant improvement in insulin sensitivity as well as a substantial reduction in fasting insulin levels, and improved blood sugar and lipid control was demonstrated in each of the studies. Since 2012, four separate, large scale meta-analyses have been conducted, all of which concluded that berberine is an effective and safe medicine for the treatment of MetS, and may even be as effective as many drugs commonly prescribed for improving glucose homeostasis (Dong et al. 2012; Wei et al. 2015; Wei et al. 2016; Lan et al. 2015). Other research has investigated the molecular basis of berberine’s effect on insulin’s action, blood glucose control, and obesity. Structurally, as an alkaloid, berberine is based on a tetra-hydroisoquinoline scaffold; a framework now recognised as a highly versatile structure, able to bind with a number of biological receptors. Experiments using several biological cell models primed for insulin resistance have additionally demonstrated the ability of berberine to up-regulate insulin receptor (InsR) expression (Ko et al. 2005; Zhang et al. 2010), enhance pancreatic β-cell function, regeneration and proliferation (Schmidtler et al. 1991; Hemmati et al. 2016; Chang et al. 2013; Wu et al. 2016), as well as positively affect the insulin signalling cascade (Chen et al. 2014; Geng et al. 2016; Chang et al. 2015). Berberine’s effects are also known to extend to reduction of carbohydrate absorption through inhibition of α-glucosidase activity (Khan 2016). Furthermore, investigation has revealed that these positive effects occur through berberine’s ability to suppress new fat-cell formation (adipogenesis) in vitro (Hu et al. 2010). Berberine has also been shown to reduce weight gain through preventing lipid synthesis, increasing the catabolism of fatty acids and enhancing energy expenditure in adipose tissue (Zhang et al. 2014; Zhao et al. 2017). Banaba (Lagerstroemia speciosa) is a multi-stemmed, deciduous flowering tree that commonly occurs in China, Korea, Japan and the Indian Subcontinent. Extracts from the leaves are commonly used to treat diabetes, obesity and inflammation in Eastern traditional medicine. Research into the phytochemical profile of Banaba leaf extract has revealed a rich source of bioactive phytochemical compounds acting on pathways from digestion to de novo glucose synthesis and insulin signalling. Of particular interest to modern research has been the role that the pentacyclic triterpenoids (PTs), a class of terpenes contained within Banaba leaf extract (BLE), play in the regulation of various signalling pathways involved in disease pathology. Structurally, PTs, together with their secondary metabolites after modification in the body, are considered highly versatile, due to their ability to bind with a number of biological targets involved in biochemical and cellular communication. Research into the role of PTs in alleviating insulin resistance has indicated that these molecules exert their glucose-lowering effect through a multi-target, multi-pathway mechanism involving carbohydrate digestion, insulin signalling and modulation of energy metabolism. In addition, research has also indicated that BLE plays a beneficial role in the control of low grade inflammation. Initial effects of BLE in glucose control take place in the intestines, where it reduces carbohydrate digestion and absorption. This is related to the inhibiting effects that certain PTs have on both α-glucosidase and α-amylase, the enzymes responsible for the digestion of various sugars and starch (Tundis et al. 2010). On the cellular level, other studies have explored the beneficial effects that BLE has on an enzyme that structurally alters InsR, namely Protein Tyrosine Phosphatase-1B, or PTP-1B. By removing a phosphate group, PTP-1B structurally damages InsR to such a degree that it becomes less sensitive to the effects of insulin, a process now widely recognised as one of the many pathways that lead to the development of insulin resistance. Studies have shown that by blocking the activity of this enzyme, damage is prevented and sensitivity to insulin is restored. Because of this ability, PTP-1B inhibitors have become attractive therapeutic targets in the treatment of obesity and diabetes. The PTs corosolic, ursolic & oleanolic acid potently inhibit PTP-1B in a dose dependant manner, with higher dosages almost completely inhibiting enzymatic activity (Ramírez-Espinosa et al. 2011). Banaba leaf extract and its biochemical actives have also demonstrated the ability to sensitize pancreatic β-cells to glucose challenge, increase the availability and directly activate InsR in an insulin independent manner, and enhance glucose transport and uptake through improvement of GLUT4 (Glucose Transporter 4) translocation to the cell membrane (Chan, Tan, and Wong 2014; Yang et al. 2016; Wang et al. 2014). Furthermore, Banaba improves lipid profiles and improves the fat-burning ability of cells through reducing lipogenesis, positively affecting fatty acid metabolism and inhibiting the differentiation of adipocytes (Bai et al. 2008; Takahashi et al. 2015; Li et al. 2016). Human studies have corroborated the evidence observed in animals. Ikeda et al. 2002 conducted a long term experiment over one year and noted significant decreases in fasting blood glucose and glucose tolerance at all time points. Another study, specifically in non-diabetic subjects, observed decreases in fasting and postprandial blood glucose and weight loss (Tsuchibe et al. 2006). In a double-blind, cross-over study, Fukushima et al. 2006 observed a lowering of plasma glucose levels with administration of corosolic acid in subjects with type II diabetes, while a double-blind, placebo controlled trial with standardized BLE of 1% corosolic acid demonstrated significant reduction in blood glucose levels after two weeks (Judy et al. 2003). Inositol is a plant-based chemical compound with the formula C6H12O6, naturally present in a variety of foods such as cantaloupe (spanspek), oranges, beans and nuts, as well as naturally occurring in the human body. Inositol occurs in nine different architectural variations, or isomers, all of which play an important role as the structural foundation for a number of primary and secondary signalling molecules involved in a wide array of metabolic and hormonal pathways. This includes insulin signal transduction, a complex process encompassing the chain of biochemical events that follow insulin binding to its receptor, and the passing of this message to the correct pathways and enzymes in a highly controlled manner. Many disorders resulting from impaired insulin signalling exhibit inositol deficiency and abnormal inositol metabolic phenotypes. Such abnormalities in inositol homeostasis affect pancreatic β-cell function, glucose uptake and metabolism and may further contribute to insulin resistance through decreased expression of InsR and disruption of the insulin signalling pathway. Resultantly, inositol supplementation, through correcting these deficiencies and thereby partially restoring metabolic abnormalities associated with insulin resistance, is beneficial to the treatment of a number of insulin-related pathologies including polycystic ovary syndrome (PCOS), gestational diabetes, type II diabetes and metabolic syndrome (Unfer et al. 2016). For example, two major inositol-derived molecules, myoinositol-phosphoglycan (MI-IPG) and D-chiro-inositol-phosphoglycan (DCI-IPG) are released from the cell membrane upon binding of insulin to its receptor. Each has its own role in regulation of glucose balance. Specifically, DCI-IPG enhances the conversion of glucose to energy, while MI-IPG is centrally involved in fatty acid metabolism. Deficiency in inositol and thus these metabolites is central to the progression of insulin resistance, resulting in an inability of the cell to regulate energy metabolism (Facchinetti et al. 2015). Interestingly, one of the mechanisms of action of Metformin is to increase the liberation of DCI-IPGs from the cell membrane, thereby potentiating the insulin signal (Baillargeon et al. 2004). Inositol supplementation has also been shown to markedly impair glucose absorption in the small intestine, as well as reduce the rate of gastric emptying and increase digestive transit, which likely plays a major role in the reduced uptake of glucose in the gut (Chukwuma, Ibrahim, and Islam 2016). Supplementation with inositol would therefore have beneficial synergistic effects with other therapies and drugs used for treatment of insulin-related disorders, enhancing the insulin signal in the light of inositol deficiency as well as potentiating some of their mechanisms of action through increased availability of secondary signalling molecules. Several double-blind, placebo controlled clinical studies have investigated the therapeutic effects of inositol on insulin resistance, focussing largely on gestational diabetes and polycystic ovary syndrome (Unfer et al. 2016). Studies in subjects with type II diabetes and MetS have also been conducted (Montanino Oliva et al. 2016; Pintaudi, Di Vieste, and Bonomo 2016). Various clinical, metabolic and biochemical parameters were assessed before and after treatment, and all reached a statistically significant improvement in insulin sensitivity and glucose metabolism, as well as a significant reduction in overall cardiovascular risk through improving lipid profiles. In many cases, the inositol group demonstrated a significant reduction in waist circumference and waist-hip-ratio, as compared to the placebo group. Furthermore, fertility and risk of complications to pregnancy where shown to be improved in all cases. The above effects have also been assessed in light of commonly prescribed drugs for MetS, and inositol supplementation was shown to exhibit synergistic beneficial effects when used in concert with treatments such as metformin and glitazones (Fruzzetti et al. 2017). • Easy to follow recipe’s. • Choices to suit any taste or budget. • Family friendly meal plan to support healthy eating habits. • Are you battling to lose weight? Complete our free assessment to help identify possible solutions to improve your weight-loss results. • We encourage you to discuss the results of the assessment with your doctor. • Exercises can be adjusted according to any fitness level or health goal.